Treasures are something of extreme value. People watch with an expectation for the considerable appraisal of a rare and precious item during an episode of the Antique Roadshow. We get excited when we see things prized. We want to protect our accumulated things and keep them close. We need to be in command of these treasures upon the earth. When one is chronically or seriously ill, the things we treasure most are eventually taken away from us. We lose the ability to travel or take a vacation. We might be too sick to work or join friends for an evening out. We may lose the ability to talk or to walk due to progressive disability. We are unable to hold the treasures upon the earth. We no longer possess them because they are the things of dust. They will all pass away. We do have tremendous riches waiting for us to store, things that will not pass away. These treasures are not of the earth but are eternal tokens of love that we gather not just for ourselves for but others as well. Our illness or disability become the very medium to receive these treasures. When one lives with this truth, the burden of our toil becomes easier to bear. For we begin to engage in the realm of heavenly treasure hunting. Even the weakest among us can engaged in this activity. How does one engage in this heavenly treasure hunt? A hunt that can take place even while trapped in a hospital bed or broken body? Easy – through little acts of surrender and supplication. Let’s define these two acts. Surrender is the intentional act of accepting something that you have no control with meekness or docility. Supplication is offering up a prayer or petition with love and humility before God. They are the two means one needs to hunt for heavenly treasure successfully. One does not need to speak or pray a certain way, just a movement of the heart will do. Practicing this when one is having a good day and making it a habit prepares these little movements of the heart easier on the really hard days. Trust that God knows the deep intention of your heart. One can begin to understand why those old souls among us say their illness or disability is the greatest gift they have ever received. They may already have many treasures in heaven stored away. What treasures does Jesus have in store for you today? Challenge for this Week: Begin storing up treasures in heaven this week by practicing little acts of surrender and supplications. They can be simple ones. When you have to bear a needle or a medical test that must be done tell Jesus, “Take this for your will, your desire, not mine.” Accept the needle or examination with joy and peace within your heart. Ask Jesus to use this pain, this struggle or this inconvenience for his perfect need or work. Know that Christ is right there with you as you live through this pain. Remember that this simple act becomes a token of love for him. Any tears shed are precious gems he catches in the palm of his hand. 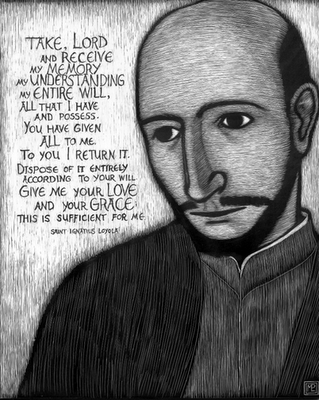 If you struggle with surrender and supplications, pray the prayer below by Ignatius of Loyola. This simple prayer is not always easy to say. If you trust Jesus enough it will help you on the journey to hunt for treasures in heaven. If this is still too hard to do, there is a musical reflection of the prayer written and song by a follower of Ignatius that can help you to open your heart to the treasure Christ wants to give you. There is even a PDF file to print out a simple prayer card to keep. Pray This Simple Prayer: Take, Lord and receive my memory, my understanding, my entire will, All that I have and possess. You have given all to me. To you I return it. Dispose of it entirely according to your will. Give me your Love and your Grace this is sufficient for me. Amen. A prayer card (PDF file) to print as a gift from the Jesuits click here. A young Jesuit missionary and musician serving Christ in Timor Leste, Indonesia and elsewhere.